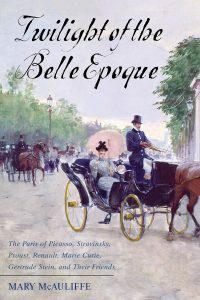 According to the introduction, Mary McAuliffe produced “Twilight of the Belle Epoque: The Paris of Picasso,Stravinsky, Proust, Renault, Marie Curie, Gertrude Stein, and Their Friends through the Great War” (Rowman & Littlefield, 2014) as a sort of conclusion to “Dawn of the Belle Epoque: The Paris of Monet, Zola, Bernhardt, Eiffel, Debussy, Clemenceau, and Their Friends.” What a pair of laundry-lists for titles. Her idea or that of her editor or publisher? A number of those artists, writers, scientists and politicians feature prominently in both volumes. Many names seem synecdochal: Monet is shorthand for Impressionists; Gertrude Stein’s The Making of Americans nods at the complex ties between France and the United States; Marie Curie speaks to the commencement of the nuclear era and the equally explosive expansion of women’s rights. I like this book. It is well organized, a mere twenty chapters moving the reader from 1900 to 1918. Each chapter focuses tightly on the lives and accomplishments of the primary cast of characters and the worlds they altered. While a cultural history like this tends to focus on the arts and humanities, McAuliffe makes space for technology (automotive entrepreneurs Fernand, Louis and Marcel Renault and André Citroën, and aviation pioneer Gabriel Voisin), fashion (couturiers Paul Poiret and to a lesser extent Coco Chanel, and cosmetics and perfume moguls François Coty and Helena Rubenstein) and politics (Georges Clemenceau and the very young Charles de Gaulle). Then there are the rivalries, marriages and affairs that ensnarl the multitudes. Indeed it is the incestuous quality of Belle Epoque society that makes of Twilight of the Belle Epoque a kind of erudite People Magazine. With the notable exception of the playwright George Bernard Shaw, there was nearly no male of artistic or cultural status—or wealth—with whom illustrious dancer Isadora Duncan did not sleep. Misia Godebska became Misia Natanson in the dawning of the era and during its twilight transforms in Misia Edwards when she marries the rich and predatory publisher of the newspaper Le Matin, and subsequently Misia Sert as wife of Spanish painter, José-Maria Sert. Through it all Misia was influential as a hostess and tastemaker and a notably pushy, and deep-pocketed patron of modernism in all the arts. A close friend was the composer Maurice Ravel (famed to most of us for his 1928 ballet, Bolero) whom she met through her brother, Cipa Godebski and his wife. And Ravel is merely one degree of separation from the musical stars in that firmament: Claude Debussy, Erik Satie, Igor Stravinsky, and others. Which, of course, brings us to the Russian impresario Sergei Diaghilev of the Ballet Russes, his dancer-choreographers Vaslav Nijinsky and Léonine Massine, and competitors and collaborators including the poet Jean Cocteau and artist Pablo Picasso. It is remarkable how McAuliffe manages this cast of hundreds and their entangled narratives, as well as the larger context of a world moving toward and then through World War I. A few individuals die, of natural causes in old age, in accidents and from illness. One is left at the end, however, at the armistice announced at the eleventh hour of the eleventh day of the eleventh month of 1918, wondering about the next twenty or thirty years, the span that will take us through World War II and will impel the shift of modern culture from Paris to New York City as the Belle Epoque implodes in darkness.